We are happy to announce our date for this year’s Dentistry From The Heart! We will hold this even on September 30th, 2017. This is the fourth annual event for Livonia Family Dental with Dr. Zuzana Grunberger and her team of dentist volunteers. We discovered this organization five years ago and it has quickly become one of our favorite and most rewarding charity events we participate in. This charity allows us to directly provide dental care for patients in the local area who otherwise cannot afford dental insurance and/or dental care. Previous events have brought relief to over 150 people and over $35,000 of dental care was donated to our community. The services we provide through Dentistry From The Heart not only help a patient’s teeth and overall health, it gives them a renewed reason to smile. 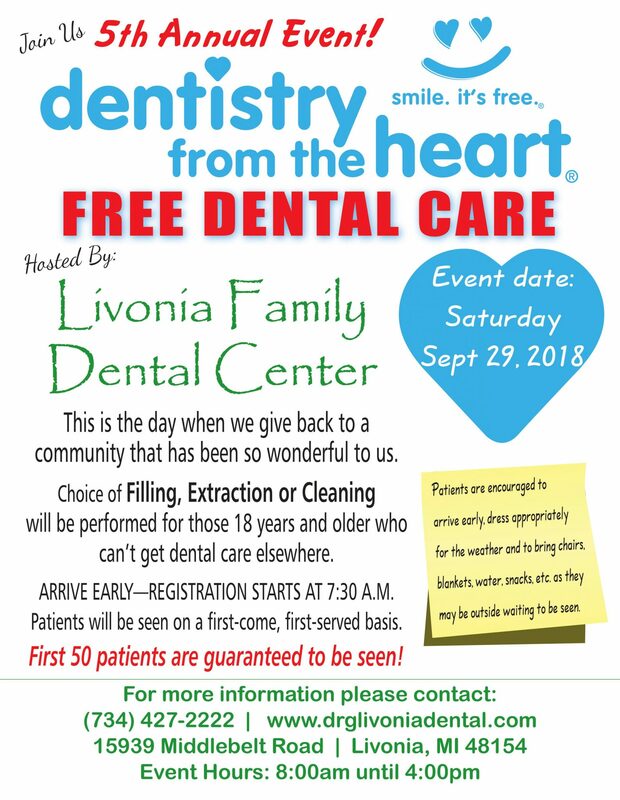 Please feel free to spread the word to those who may be in need of dental care. We guarantee to provide dental care to the first 50 patients that arrive. Registration starts at 7:30 am and is done on a first-come, first-served basis. Please see the flyer below for all necessary information, and don’t hesitate to call us at (734) 427-2222 for more information.